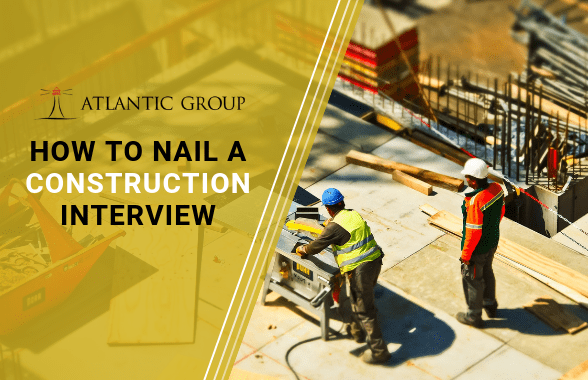 Preparation and organization are the keys to making a great impression during a construction interview. From conducting initial research on companies to showcasing your special skills and certifications, you will stand out from the competition if you plan accordingly. Below are six tips to help you nail your next construction interview. On a construction site you’ll be required to perform a broad range of industry-specific tasks. These tasks can range from management skills, design skills to technology and office skills. In your interview be sure to touch on any relevant skills that may be beneficial to the job. Prepare photos of construction work you’ve completed to share with the hiring manager – discuss the project and the technical skills you used to complete it. Regardless of the type of construction position you are applying for, you will likely be working on a team. By showcasing your ability to work well with others, you will gain a nice edge over other applicants. You will want to focus on examples that demonstrate relevant experience to the role you are applying for. Be sure to discuss your past employment experiences working in groups and give examples of projects where you may have led a team to positive results. Construction projects involve financial planning, time management, and attention to safety protocol. Make sure the hiring manager knows that you are a detail-oriented person by giving examples of a thorough personal budget, detailed school or work schedule, and your ability to plan long-term projects. References from supervisors and instructors who note your keen attention to detail are also very valuable. If you are licensed to operate heavy machinery or vehicles, or special cutting-edge tools, make sure to emphasize this in your interview. Whether you are an expert at crane operation or have experience operating forklifts, your experience is relevant and could be a deciding factor when a hiring choice is made. Most importantly, if you have any licenses or certifications, bring a copy to your interview. Management experience and office skills can help set you apart from candidates who lack this experience. If you have successfully overseen crews of 10 to 20 people, be sure to include your experience on your resume and emphasize it during your interview. Likewise, if you are proficient at Excel, CRM platforms, or special software, make sure your interviewer knows about those special skills. By following the six tips above, you will make a positive impression on your interviewer and position yourself as a front runner for the position. At Atlantic Group, we work with candidates to help them find a company that will be a great fit for them. If you’re looking for a recruiter to help increase your odds of nailing your next construction interview, contact us today to learn more about what we can offer.